On Thursday I’m going to be bringing you my first ever ice box cake recipe, and to do that, today’s the day I’m going to show you how to make your very own homemade chocolate graham crackers. Because, depending on where you live, you might not have the luxury of being able to pop down to the supermarket and pick some up. And chocolate graham crackers are just perfect for an ice box cake. You can’t substitute in a bourbon biscuit. It just won’t have the same texture. 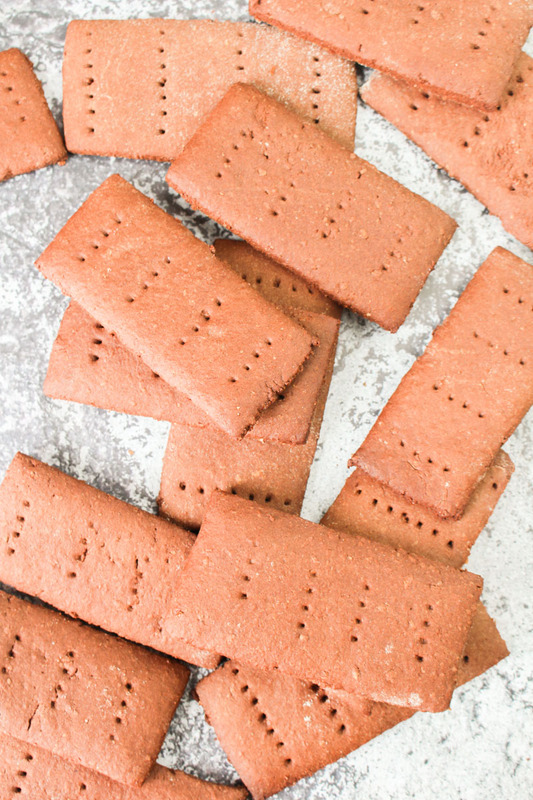 Graham crackers aren’t your normal cookies. You are going to use graham flour (if you can get it) or wholemeal plain flour, as well as some of the usual plain flour. This flour ratio is going to give you the typical graham cracker taste, which if you’ve had one before, you’ll instantly recognise. If you don’t want to turn these chocolate graham crackers into an ice box cake, then they would make an amazing cookie for s’mores. Get hold of some chocolate marshmallows, and you’ve got yourself the ingredients for a triple chocolate s’more extravaganza. 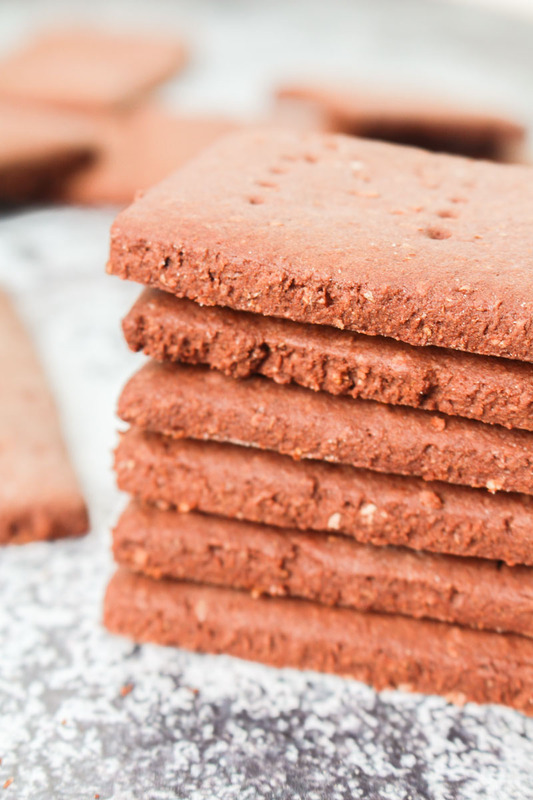 You can cut these chocolate graham crackers into whatever shape you want – I went for a typical rectangle shape, as I knew this would fit best in my loaf tin when making my ice box cake. But squares would be great for s’mores, or just go crazy and use whatever cookie cutter takes your fancy. One of the great things about these cookies is that they really won’t spread too much in the oven. Make sure you chill the dough as per the instructions below, and don’t worry if the dough seems a little wet – it will harden up to a roll-able consistency in the fridge. Homemade chocolate graham crackers, with the unique graham cracker taste, and no preservatives or E numbers. Put both types of flour, cocoa powder, baking powder, bicarbonate of soda, and salt into the bowl of your stand mixer, or a large bowl if using a hand mixer. Give these ingredients a good mix, and then add the cubed butter. Mix on a medium-high speed, until all the butter has been incorporated, and the mixture looks like sand. Add the sugar to the bowl and mix well. In a small bowl or jug, mix the honey, vanilla, and milk together. Add the milk mixture to the dry ingredients, and beat on medium until a fairly smooth soft dough forms. Wrap the dough in clingfilm or plastic wrap and pop in the fridge to chill for at least two hours, or overnight. Once the dough has chilled, preheat the oven to 180°C / 350°F (160°C fan). Remove the dough from the fridge and knead together on a floured surface. Roll out the dough to about an 1/8 of an inch thick, and cut into rectangles (or use a cookie cutter to make shapes) and prick the top of the crackers with a fork to get the graham cracker look. Place the crackers on baking sheets (there is no need to grease or line) and bake for 13-15 minutes, or until the edges are firm and the centres are slightly springy when pressed. Leave to cool on the baking sheets for 5 minutes, and then carefully transfer to wire racks to finish cooling. The cookies will last for a week or so if stored in an airtight container in a cool dry place. Please note that baking times may vary if making smaller cookies - please check on them after 8 minutes. These tasted just like chocolate teddy grahams. I have also now discovered that there is a cereal called Teddy Grahams Breakfast Bears and I WANT IT. I will find it for you one day!